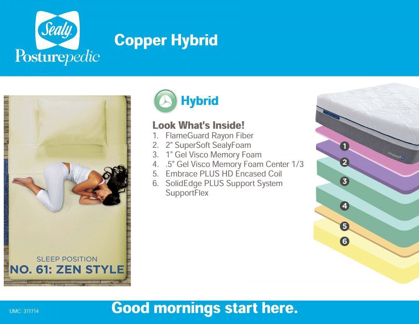 The Posturepedic Copper Plush hyrbrid Mattress pairs plush support with body-conforming comfort. This half innerspring, half memory foam hybrid mattress pairs designer comfort with sleep technology. Cooling gel memory foam helps to reduce motion transfer while dispersing body heat while you sleep. Cradling memory foam comfort lets you sink into a restful sleep while the Embrace Premier Coils give you the firm support your body needs at night. Get the rest you deserve on this Sealy Posturepedic mattress.